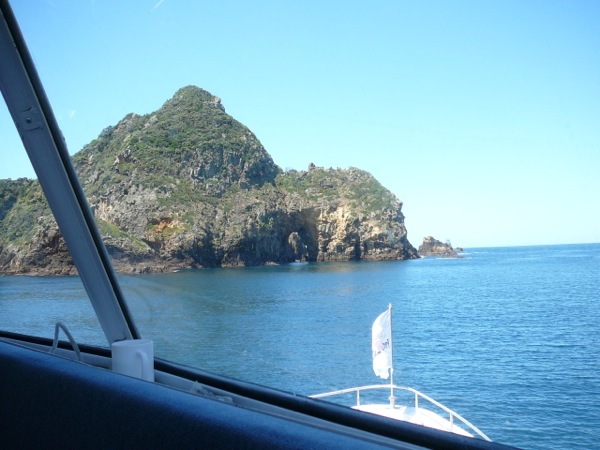 The coast includes the quiet inlet of Ngunguru, the Tutukaka and its famous marina, Matapouri, Whale Bay and Sandy Bay – all magic places, but the crown in the jewel is the off shore island marine reserve called The Poor Knights. 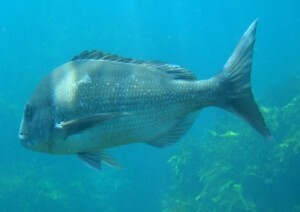 I live just over an hour south of the Tutukaka Coast, and at least once a year I try and go out to the Poor Knights Islands snorkelling on a trip called A Perfect Day. 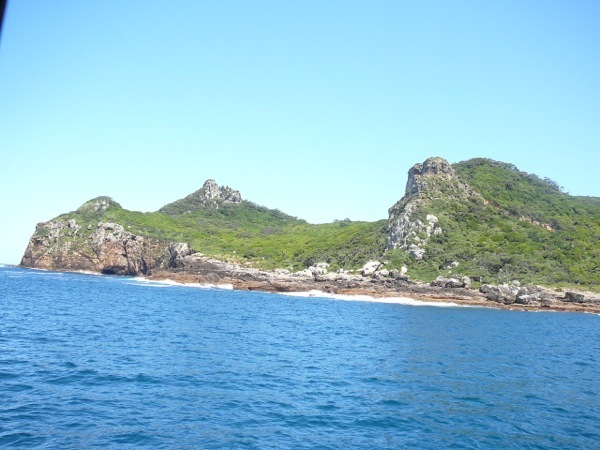 This year I gather a group of friends on 1 January – it is a perfect Northland summer day – the sea flat, the sky blue. 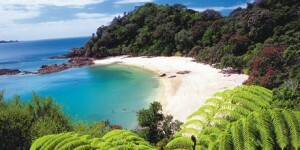 Our perfect day starts with breakfast at Schnapper Rock which is conveniently right beside Dive Tutukaka’s office. A coffee or breakfasts is a mandatory start to the day for me – and as the trip does not leave until 11am, there is lots of time to enjoy it. 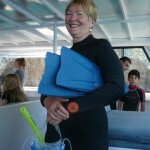 As we board the boat, we are fitted out with flippers and snorkel and sized up for our wetsuits – they are very good at this, and I notice no one returning their wetsuits for a larger or smaller pair. 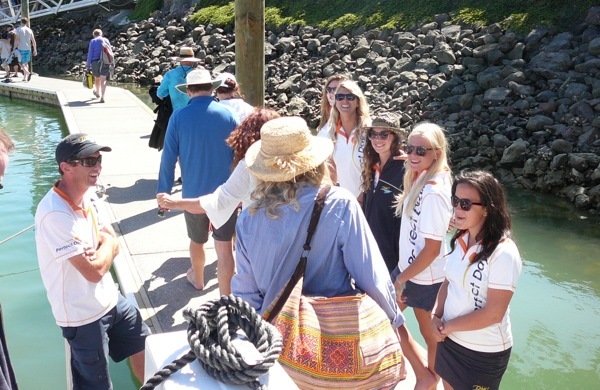 There are lots of choice – even for the youngsters on the boat. 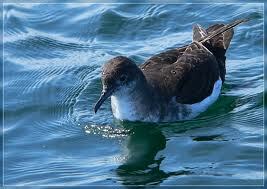 We are only just out of the Tutukaka Marina when we have the first special sighting of the day – a school of trevali schooling and hundreds of Bullers Shearwaters feeding. 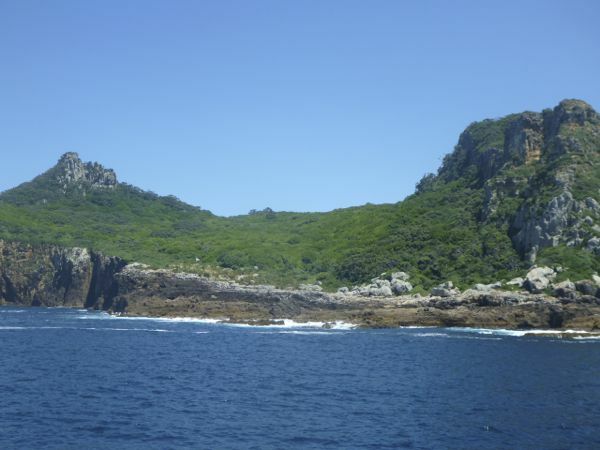 This bird only nests on the Poor Knights Islands, and its population was once down to 15,000. 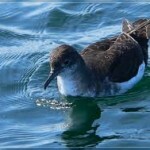 Now it numbers in the millions and is thriving in this offshore reserve. Its a 40 minute ride to the Knights, and we are given a great introduction to safety on board, and on the island itself, and also had a chance to just chill and take in the view which was magic. The islands are remnants of an old volcano and are now best free and home to some unique flora and fauna including natural populations of Tuatara, the giant weta, which lays claim to being the heaviest insect in the world, and the Poor Knights Lily. 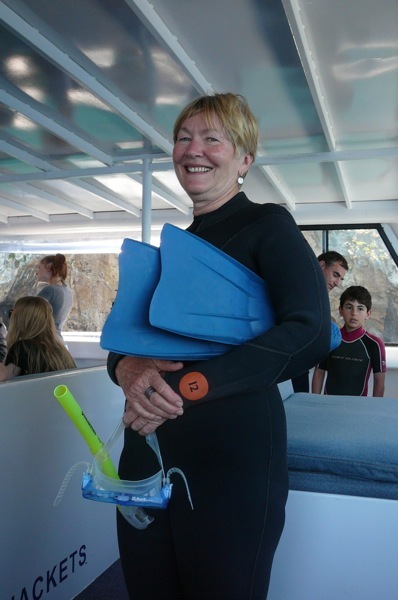 But it is the underwater experience we are mostly here for, and as soon as the anchor is secured at my favourite snorkel spot – The Gardens – Cynthia and I are off the back of the boat and heading for the cliff. One thing I have learned that, like us, fish thrive in the shade of the steep cliffs – they are safer there I guess. As I said I have done this trip many times, but it only gets better. 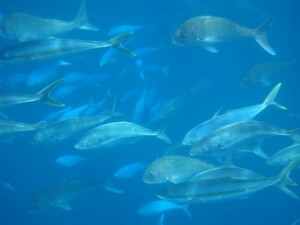 There were literally dozens of grandaddy schnapper, parrot fish and others gathered in the shade. We almost had to literally fight out way through them, though fish have the amazing ability to move around you without touching. We were later told that since the marine reserve was set up in 1998, the number of fish has increased 15 times, and the size of them has doubled. One of the features of The Gardens dive spot is the arches and caves you can swim into. At one moment it seems the sunbeams are shooting through the water, then there is a veil of darkness and shadow where you can see nothing. A quick check to see I am not actually going to swim bang into the cliff, I hold my breath and kick into the darkness. And a miracle happens, the sun has gone, but a new blue world emerges that is absolutely wall to wall fish. No wonder the numbers are increasing, there are thousands of small fish hiding in the shade away from the gannets. After our snorkel, it was back on board for a scrummy lunch and hot drink. We could choose whether to then go back and snorkel, or try paddle boarding or kayaking. I opted for a kayak and headed along the bay to kayak into the Rico Rico cave – the largest sea cave in the world. It is awesome to be in there with no other boats. 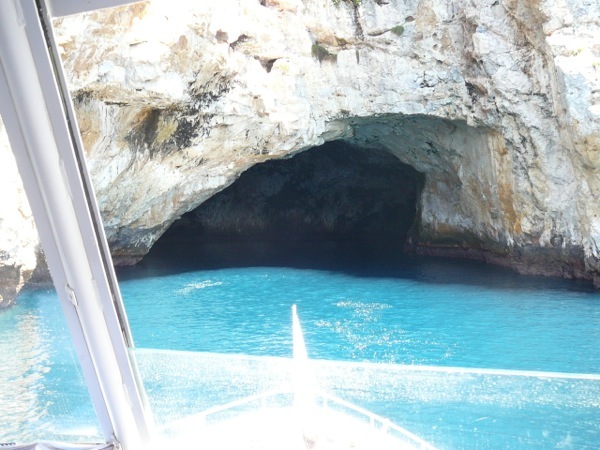 Then it was off for a cruise around the Islands – more schooling trevali and blue mao mao, diving gannets as we headed into the Ricorico cave. 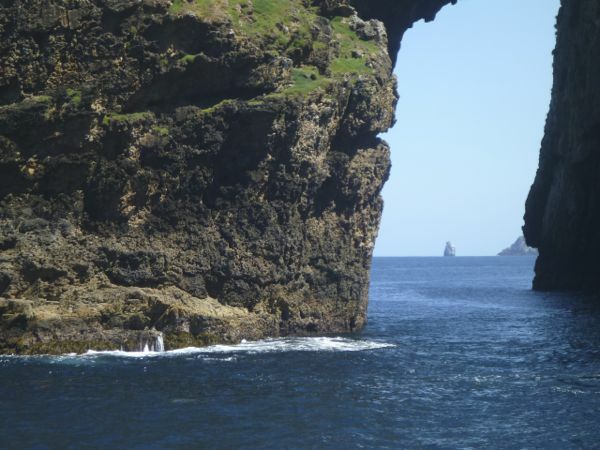 We went through arches – Bay of Islands eat your heart out – this beats yours! The captain filled us in with the poignantly sad story of how Maori settlement came to and end here. Reluctantly we headed back to shore – most of us nodding off, we said a warm farewell to the crew, then headed into Schnapper Rock for a cold beer. 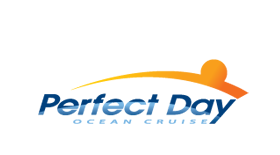 We all agreed it had been a perfect perfect day, and a stunning way to start a new year. I will of course be back! I’ll on the north Lisandro in mid March 2017. 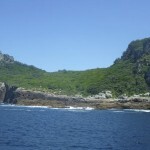 The perfect day snorkeling at Poor knights island sounds wonderful. Will be traveling solo. Can you let me know where to stay and how much such an excursion will cost?